Last Christmas, I bought a friend a gift. And then immediately bought myself one. That’s how it goes, right? One for you and one for me. I’m pretty sure that’s how the wise men did the first Christmas. Myrrh for you, myrrh for me. This present was the all pie cookbook from Four & Twenty Blackbirds. If you don’t know Four & Twenty Blackbirds, you wanna know it. 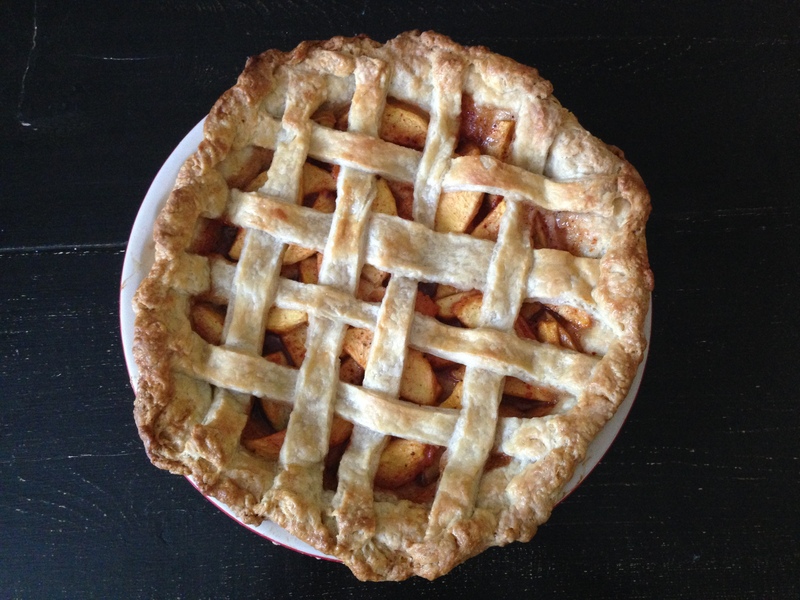 It’s a pie shop in Brooklyn run by two sisters, Melissa and Emily Elsen. These gals learned how to make pie from their grandmother and they are killing the pie game. I got the cookbook for Christmas (for myself) and then was immediately too intimidated to make a pie. Because let’s be real, you can’t use any Pillsbury crust for a cranberry and sage pie. The crust is crucial and needs to be made from scratch. A few when planning for a pool day with my friends Lindsay and Tim, it was put up or shut up. This was the perfect occasion to make a pie. Tim and Lindsay are adventurous eaters and enjoy (dare I say, seek out!) unique flavor combinations. Plus, it’s summer, so you know the fruit is begging to be turned into a pie. So, I decided to make one. With the best of summer fruits and knowing Lindsay and Tim’s appetite for adventure (PUN INTENDED), I decided to make a paprika peach pie. You heard me. Paprika peach pie. And might I say, it was delicious. A little ugly, but dee-licious. This pie was so fresh and so sweet, with a touch of spice from the paprika. The rich buttery crust should not be skipped. It was hard to do (particularly being my first time), but well worth the time and effort. My lattice looks like a 4th grader did it, but OH WELL. I DID IT. Cover this with cat up with whipped cream and eat it. You will not be disappointed. 1 to 2 dashes Old Fashion bitters | I had Angostura bitters at home and used that. Worked well! Demerara sugar, for finishing | I left this out because I didn’t have any. It would’ve looked better if I’d included. Have ready and refrigerated one pastry-lined 9-inch pie pan and pastry round or lattice to top (double-crust recipe below). Bring a large pot of water to a simmer. Have ready a large bowl of ice water. Score an X into the bottom of each peach, and then drop it into the simmering water for 30 to 60 seconds. Remove and immediately drop into the ice water. Slice the peeled peaches into ½-inch slices, add to a large bowl, and sprinkle with the lemon juice. Add the granulated and brown sugars, potato starch, paprika, white pepper, allspice, ginger, salt, and bitters and toss well to combine. Spoon the filling into the refrigerated pie shell, leaving behind excess juices. Arrange the lattice or pastry round on top, and crimp as desired. Chill the pie in the refrigerator for 10 to 15 minutes to set the pastry. Meanwhile, position the oven racks in the bottom and center positions, place a rimmed baking sheet on the bottom rack, and preheat the oven to 425°F. Brush the pastry with the egg wash to coat; if your pie has a lattice top, be careful not to drag the filling onto the pastry (it will burn). Sprinkle with the desired amount of demerara sugar. Place the pie on the rimmed baking sheet on the lowest rack of the oven. Bake for 20 to 25 minutes, or until the pastry is set and beginning to brown. Lower the oven temperature to 375°F, move the pie to the center oven rack, and continue to bake until the pastry is a deep golden brown and the juices are bubbling throughout, 30 to 35 minutes longer. Add the butter pieces and coat with the flour mixture using a bench scraper or spatula. Sprinkle 2 tablespoons of the ice water mixture over the flour mixture, and mix and cut it in with a bench scraper or spatula until it is fully incorporated. Add more of the ice water mixture, 1 to 2 tablespoons at a time, using the bench scraper or your hands (or both) to mix until the dough comes together in a ball, with some dry bits remaining.